Just like almost all previous Zelda games to date, Skyward Sword has several bottles found throughout the land. Below is a listing of all five bottles found in the game with locations, what you need to get them, as well as your reward. After, you will also find all liquids that can be contained within a bottle, including potions, water and spores, with descriptions, pictures and advice for all of them. 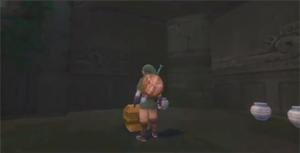 The first empty bottle can be found in the Bazaar after Zelda disappears. Speak with the Luv, the Owner of the Potion Shop, who will notice you don't have an empty bottle to put potions in, and will give you one for free. The second empty bottle can be found in the Sealed Grounds to the right of the Old Woman. Open the chest there to find a Revitalizing Potion inside of the bottle. Run on over to the Plaza in Skyloft, near where the Light Tower is located. Here you will find Parrow patrolling the area. He is wondering where his little sister Orielle is. She had gone out for a quick flight, but she hasn't returned. Parrow tells you that she was heading for the colorful island in the southwestern sky. Jump off the nearby ledge and call your Loftwing. If you look at the southwestern part of the map you will see a small colorful island here. If you've been to this island already you'll know that it is referred to as Fun Fun Island. Just to the east of this colorful island is where you will find a small circular island. You can place a beacon here as this is our destination. Fly on over to this small circular island and you will find Parrow's younger sister, Orielle. You will find that Orielle is stranded on this island since her Loftwing got hurt and cannot fly. Orielle is in need of bird medicine to help out her Loftwing and asks Link to bring her some. Orielle's older brother Parrow has the bird medicine that she needs, so jump back on your Loftwing and return to Skyloft. Once you arrive at the Plaza in Skyloft, speak with Parrow and let him know what is going on. He will give you some Mushroom Spores to heal Orielle's bird. In addition tot he Mushroom Spores that he gives you, Parrow will allow you to keep the Empty Bottle! Sweet! In the Fire Sanctuary, go to the first room where you saw the lone Magmanos enemy. After you get the Mogma Mitts, use them to open a gate leading to the water plants, then defeat the Magmanos. Go through the ground-level passage that is now accessible to reach a chest containing this Bottle. The fifth empty bottle can be found from a Goddess Cube chest located in the western half of Thunderhead. The Goddess Cube is located in the cave leading to the Fire Sanctuary, in the room that leads to the Fire Dragon, and can be reached on a floating platform that appears during the quest to reach the Dragon. To reach the chest you must burrow through a hole on the island to reach a barred room, wherein you can climb a set of vines to reach the chest. Heart Potion can be purchased at the Potion Ship in the Bazaar on Skyloft for 20 rupees. It will restore 8 hearts and can be upgraded twice at the Infusion Shop. For more information on upgrading Heart Potions, check out our Upgrades page. For more information on its upgrades, check out the Heart Potion + and the Heart Potion ++ pages at the Zelda Dungeon Wiki. Read More about the Heart Potion at the Zelda Dungeon Wiki. You can obtain Heart Potion + after upgrading regular Heart Potion at the Infusion Shop in the Bazaar on Skyloft. It will restore all hearts and can be upgraded once. For more information on its previous incarnation and its upgrades, check out the Heart Potion and the Heart Potion ++ pages at the Zelda Dungeon Wiki. Read More about the Heart Potion + at the Zelda Dungeon Wiki. You can obtain Heart Potion ++ after upgrading Heart Potion + at the Infusion Shop in the Bazaar on Skyloft. It will restore all hearts, and has two servings. For more information on its previous incarnations, check out the Heart Potion and the Heart Potion + pages at the Zelda Dungeon Wiki. Read More about the Heart Potion ++ at the Zelda Dungeon Wiki. Revitalizing Potion can be bought from the Potion Shop in the Bazaar on Skyloft for 50 rupees. It can also be found in a chest in the Sealed Temple. It will replenish four hearts and completely restore a shield. It can be upgraded twice. For more information on upgrading Revitalizing Potions, check out our Upgrades page. For more information on its upgrades, check out the Revitalizing Potion + and the Revitalizing Potion ++ pages at the Zelda Dungeon Wiki. Read More about the Revitalizing Potion at the Zelda Dungeon Wiki. Revitalizing Potion + can be obtained after upgrading regular Revitalizing Potion at the Infusion Shop in the Bazaar on Skyloft. It will completely restore a shield meter, and will activate automatically and restore a shield if it does break. It will also restore 8 hearts, and can be upgraded once. For more information on its previous incarnation and its upgrade, check out the Revitalizing Potion and the Revitalizing Potion ++ pages at the Zelda Dungeon Wiki. Read More about the Revitalizing Potion + at the Zelda Dungeon Wiki. Revitalizing Potion + can be obtained after upgrading regular Revitalizing Potion at the Infusion Shop in the Bazaar on Skyloft. It will completely restore a shield meter, and will activate automatically and restore a shield if it does break. It will also restore 8 hearts and contains two servings. For more information on its previous incarnations, check out the Revitalizing Potion and the Revitalizing Potion + pages at the Zelda Dungeon Wiki. Read More about the Revitalizing Potion ++ at the Zelda Dungeon Wiki. Guardian Potion can be bought from the Potion Shop in the Bazaar on Skyloft for 200 rupees. It will cut damage from enemy attacks in half for a short period of time and can be upgraded once. For more information on upgrading Guardian Potions, check out our Upgrades page. For more information on its upgrade, check out the Guardian Potion + page at the Zelda Dungeon Wiki. 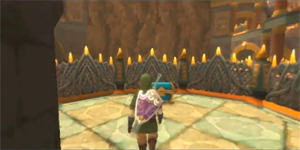 Read More about the Guardian Potion at the Zelda Dungeon Wiki. Guardian Potion + can be obtained after upgrading regular Guardian Potion at the Infusion Shop in the Bazaar on Skyloft. It will cut damage from enemy attacks in half for a short period of time and has two servings. For more information on its previous incarnation, check out the Guardian Potion page at the Zelda Dungeon Wiki. Read More about the Guardian Potion + at the Zelda Dungeon Wiki. Stamina Potion can be bought from the Potion Shop in the Bazaar on Skyloft for 50 rupees. It will prevent the stamin meter from depleting for a short time and can be upgraded once. For more information on upgrading Stamina Potion, check out our Upgrades page. For more information on its upgrade, check out the Stamina Potion + page at the Zelda Dungeon Wiki. Read More about the Stamina Potion at the Zelda Dungeon Wiki. Stamina Potion + can be obtained after upgrading regular Stamina Potion at the Infusion Ship in the Bazaar on Skyloft. It will completely restore a stamina meter and prevent it from depleting for three minutes. For more information on upgrading Stamina Potions, check out our Upgrades page. For more information on its previous incarnation, check out the Stamina Potion + page at the Zelda Dungeon Wiki. Read More about the Stamina Potion + at the Zelda Dungeon Wiki. Air Potion can be bought from the Potion Shop in the Bazaar on Skyloft for 50 rupees. It will prevent the air meter from depleting for a short time and can be upgraded once. For more information on upgrading Air Potions, check out our Upgrades page. For more information on its upgrade, check out the Air Potion page at the Zelda Dungeon Wiki. Read More about the Air Potion at the Zelda Dungeon Wiki. Air Potion + can be obtained after upgrading regular Air Potion at the Infusion Shop in the Bazaar on Skyloft. It will completely restore the air meter and prevent it from depleting for three minutes. For more information on its previous incarnation, check out the Air Potion page at the Zelda Dungeon Wiki. Read More about the Air Potion + at the Zelda Dungeon Wiki. Fairies can be found in various locations in dungeon and other areas. They can also be obtained after drawing a Triforce on a Goddess Wall, or by pouring Glittering Spores on a Heart. They will completely restore six hearts in the health meter, and will do so if Link loses all of his health. Read More about Fairy at the Zelda Dungeon Wiki. Water can be obtained from any river, pond or sacred fountain in Skyward Sword. It has no special properties or effects. Read More about Water at the Zelda Dungeon Wiki. Sacred Water can be found in the Skyview Temple's fountain. It will heal the Water Dragon Faron to her normal state. Read More about the Sacred Water at the Zelda Dungeon Wiki. Glittering Spores can be obtained after slashing a Glittering Mushroom in the Faron Woods and scooping up the spores with an empty bottle. They will also be given to you by Parrow in the Parrow and Orielle Sidequest to help heal Orielle's Loftwing. You can dump them on enemies to stun them temporarily, or on insects to slow them down immensely. Read More about the Glittering Spores at the Zelda Dungeon Wiki. Mushroom Spores can be obtained after slashing a large mushroom in the Faron Woods and scooping up the spores with an empty bottle. There are five uses with every bottle scooped, and they can be used to change hearts into fairies, change rupee value, and stun enemies and bugs. Read More about the Mushroom Spores at the Zelda Dungeon Wiki. Hot Pumpkin Soup can only be bought at the Lumpy Pumpkin for 10 rupees and it will restore 8 of Link's hearts. After being in a bottle for 5 minutes it will turn into Cold Pumpkin Soup, which will only restore 4 hearts. Read More about the Hot Pumpkin Soup at the Zelda Dungeon Wiki. Cold Pumpkin Soup can only be obtained after buying Hot Pumpkin Soup. When 5 minutes have passed, the Hot Pumpkin Soup will turn into Cold Pumpkin Soup. It will only restore 4 hearts compared to the 8 hearts from Hot Pumpkin Soup. 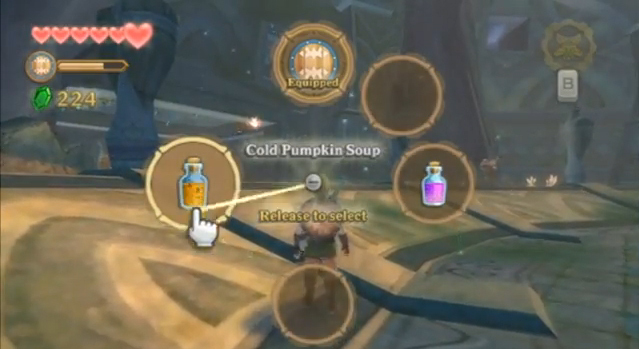 Read More about the Cold Pumpkin Soup at the Zelda Dungeon Wiki.